During my end-of-week pantry clean out I was determined to use up some open packages of dry goods. I found some sultana raisins languishing in the back and a half-full jar of applesauce in the fridge. My solution? 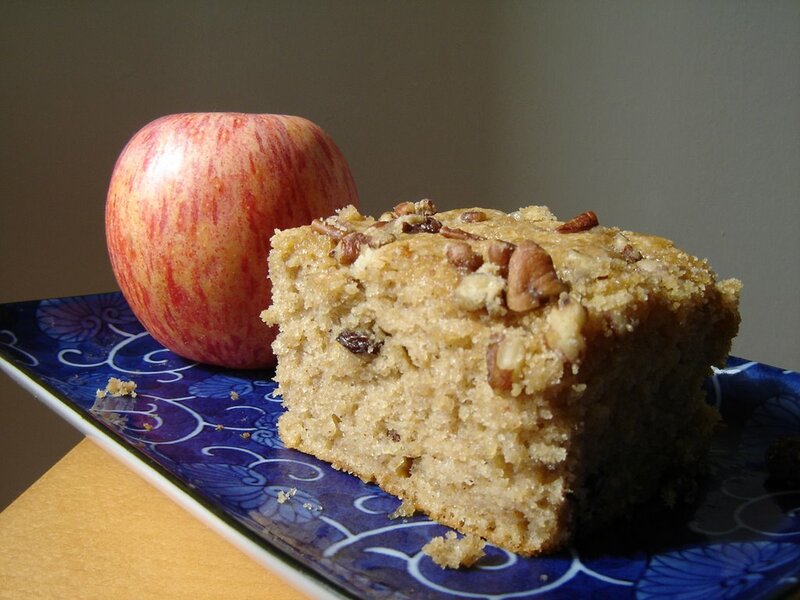 Make a super easy, quick and yummy apple cake. The misleading thing about the title of this recipe is that there are no fresh apples in the actual cake. It uses applesauce and dried apples. I did not have dried apples so I opted to use my raisins. I have made this cake before and it is the perfect definition of a 'snacking cake'. 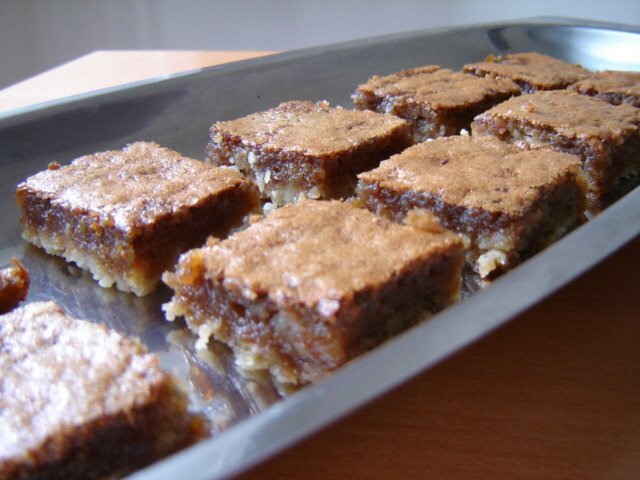 It has a moist, dense crumb and goes well with any type of hot beverage you like. The pecan streusel on top lends a nice crunch to the cake and the house smells great while it is baking - like you've made a pie only with less work involved. If you're looking to make an unpretentious, down-home cake, try it out. Yesterday Elizabeth had a get-together for The Girls. It is not something we get to do often since some friends travel all the way from St. Catharines to get here. I provided cookies for the party and made Toffee Pecan Cookies from The Good Cookie. 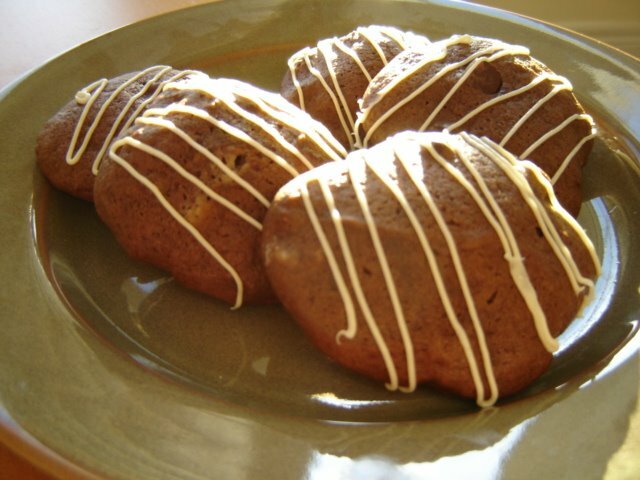 This cookie is of the drop type and includes three eggs which mixes up into a soft batter. I wasn't sure how they would turn out but the lure of toffee and pecans together had me itching to try. I made the cookies by the book except that I only baked them for 12 minutes. Any longer and they would have been inedible. Boyle writes that they are 'unattractive but addictive' and they do have a crater-type look to them. The cookies are crispy on the edges and cakey throughout. 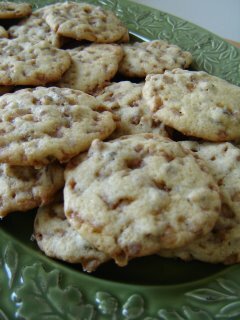 I used Skor bits that distributed nicely throughout the cookie so each bite had some toffee flavour. On the whole they were well received and are great when you need a lot of cookies - I think I made 4 1/2 dozen. I think next time I might try chopped Skor chocolate bars for extra flavour. 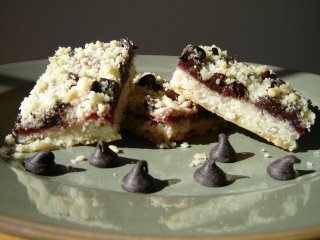 Recipe Update - If you would like to try the Chocolate Raspberry Crumble Bars with white chocolate chips, try prebaking the crust before adding the jam and chips. I did not do this and the white chips ended up looking like butterscotch ones after 40 minutes. They were still good to eat and I dressed them up by adding a drizzle of white chocolate. Also I'd like to say hi to Bay Area Bakers A. and H. M.. Thanks for reading! I seemed to have an abundance of super-ripe bananas on my counter over the past few days and I wanted to make a cake with them. I pulled out an old recipe binder and found the tab called 'Nick Malgieri'. As I looked through what I had, the recipe for Cocoa Banana Coffee Cake caught my eye. 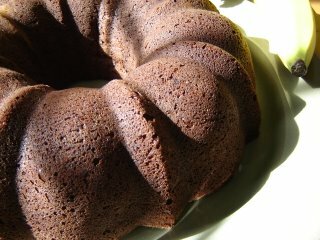 I had all the ingredients and the cake was what I was looking for - a no fuss Bundt that packed a chocolate punch and used 4 bananas. We were in business. I can't rave enough about this cake. The batter mixed up into a deep brown colour that was the consistency of semi-chunky pudding. It baked for exactly 55 minutes and rose beautifully. I turned it out to cool and couldn't wait to try it. 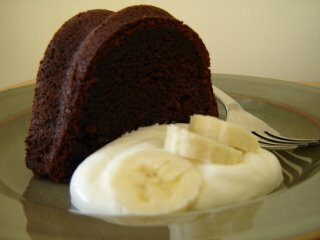 The cake is deliciously moist with a perfect balance of chocolate and banana. It is a notch above regular chocolate cake and Malgieri suggests having a slice with chocolate ice cream. The recipe is a keeper and everyone loved it so much I have none today. Good excuse to make another one sometime soon. If you're interested, the recipe comes from the aptly titled book, Chocolate. Tea biscuits, or scones, are another favourite treat in our house. They in no way resemble the rock-hard variety that can be purchased at the local grocery store. The great thing about scones is that they can be tailored to suit everybody's tastes. Mr. CB likes his with chocolate chunks and since I had some leftover from Triple Chocolate Chunk Cookies, I obliged. The recipe I used comes from Canadian Living. The dough mixed up nicely and instead of shaping them, I just dropped scoops of dough onto the cookie sheet and flattened them slightly. After a sprinkling of coarse sugar, they were ready to be baked. Pulling out a fresh tray of scones from the oven really makes my day. They were golden, sparkly and studded with chunks of soft melted chocolate. The outside was lightly browned and crisp and when you bit into them, the fluffy centre revealed itself in all its glory. There's no way you could break a tooth on these! Try them with anything you like - raisins, currants, dried fruit...the possibilities are almost endless. I've always loved shortbread. The beautiful simplicity of mixing butter, sugar and flour together to get a crumbly melt-in-your-mouth cookie amazes me. It is an uncomplicated, international buttery morsel that can be dressed up in a whole lot of different ways. For this version I added pistachios. I usually like to add chocolate chunks to mine but the crowd I was making them for were nut-lovers. Always up for something different, I roughly chopped the yummy red/green nuts and mixed them into my favourite shortbread recipe. The cookies came out very lightly browned on the bottom and were pleasingly firm yet not dry and chalky. They had a sutble sweetness to them making them perfect for tea. 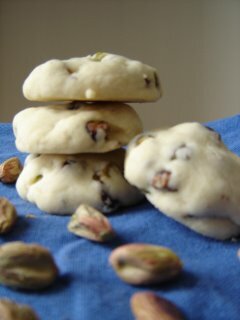 The pistachios added some nice texture and crunch to the finished cookie. 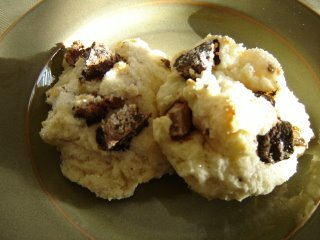 I enjoyed the nut shortbread and would like to try them again using pecans and toffee bits. Today long-time friends who live overseas came back to Canada for a visit. This was very exciting since I haven't seen them in 3 years. My neighbour Elizabeth (who happens to be the sister of one friend) asked me to make a carrot cake for dessert. I happily obliged and iced it with cream cheese icing. The big decision was how to decorate it. Elizabeth said she wanted chocolate flowers so I said no problem. While I was at the library this morning I was looking through the cookbook aisle and saw The Whimsical Bakehouse. I had already looked through this book before and I knew they used melted chocolate to make designs. I took it home for inspiration. A couple hours later this was the final product. I apologize for the poor picture quality but the Ontario skies did not co-operate with me and remained cloudy all day. The flowers, sun, stems, clouds and words are all melted and tinted white chocolate wafers. I drew the pictures out on parchment paper and traced them with the chocolate. I piped the grass on afterwards as well as the ubiquitous "V" birds most commonly seen in grade 5 drawings. It was great fun working with the melted chocolate. You can pretty much make any design your heart desires and hopefully I'll get better the more I try. I'm waiting in anticipation to do it again soon...its much easier to snack on chocolate wafers than buttercream icing. My little neighbour Y loves chocolate cake. He's a four year old chocoholic in the making. Whenever I'm visiting his house he always asks for it even though he knows there isn't any around. He sits patiently at the kitchen table with such a hopeful look that I always want to make one magically appear just to make him happy and smile. This morning I made him his very own chocolate cake complete with sprinkles. I also told him that he didn't have to share it with anyone but his mom vetoed this idea - I'm apparently supposed to encourage sharing. Needless to say, he was very happy with his cake and succeeded in eating the top half with the icing. He made my day when he looked at me across the table and said, "This cake is very good." 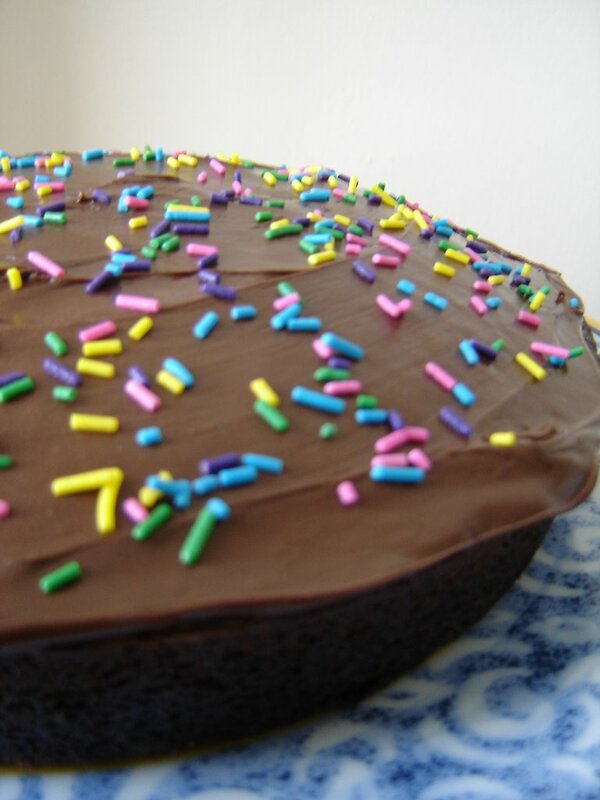 If you want to make someone smile, make this cake. It is super easy and can be mixed in one bowl. It is dark, moist and chocolaty. The recipe is from The Fannie Farmer Baking Book by Marion Cunningham. If you don't have time to make icing use Nutella. I iced this cake with it and I think it was more popular than the cake itself. Great in a pinch. Preheat the oven to 350 F. Grease and flour an 8-inch square pan. Combine the flour, baking soda, sugar, cocoa and salt in a bowl. Make 3 holes and pour vinegar into one, the vanilla into another and the oil in the remaining one. Pour water over all. Using a fork, stir mixture well. The batter will almost be smooth - a few small lumps are okay, and will disappear in baking. 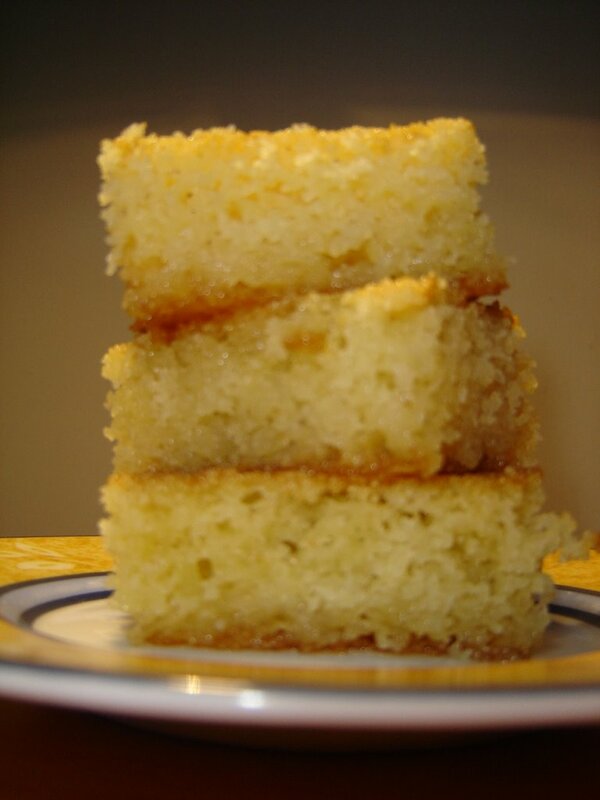 Bake for about 30 minutes, or until a toothpick inserted in the centre of the cake comes out clean. Remove from oven and cool for 5 minutes before turning it out onto a rack. Cool completely before icing or dusting with icing sugar. *I used an 8-inch round pan. What do you make at 9pm on a Sunday night when your household is looking for a sweet treat? Nothing too involved, right? Well not at my house. 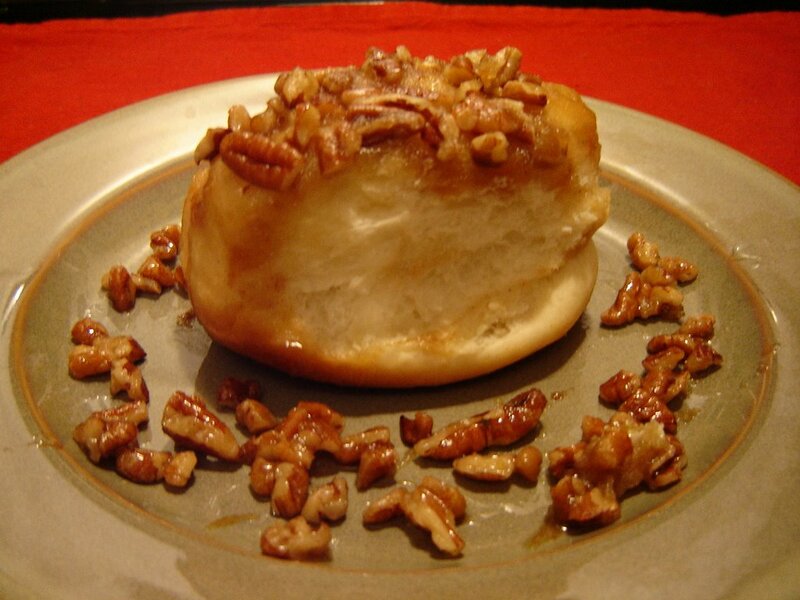 We whip up homemade pecan sticky buns just like that. After much begging from Mr. CB and several incredulous looks from me as well as many "Are you serious?" statements, I relented and got the goods out and went to work with the promise of getting help in the kitchen. (When I did ask I got, "Really? I didn't actually mean help, you know?") Right. If you're interested, the recipe is from The Clueless Baker by Evelyn Raab. The buns are made from a sweet dough filled with a basic butter, sugar cinnamon filling and topped with pecans, butter and brown sugar. Finding comarable recipes on the Internet should not be too hard or just use your own favourite family recipe. It's all good. Last night my sister had some friends over for a small get together. Everyone usually contributes to the food stash and we decided to make hot artichoke dip for something savoury and ultra yummy triple chocolate chunk cookies for the sweet. This is another one of my favourite recipes and it comes from Wanda's Pie in the Sky. Milk, bittersweet and white chocolate are combined with pecans in a delicious brown sugar cookie dough. I made the chunks large because when they come out of the oven the chocolate melts in your mouth. The next day they are equally as good even with the firmed-up chocolate. Wanda writes that "this is a chocolate chip cookie all grown up". Well I agree, but don't be fooled - little kids love these too. 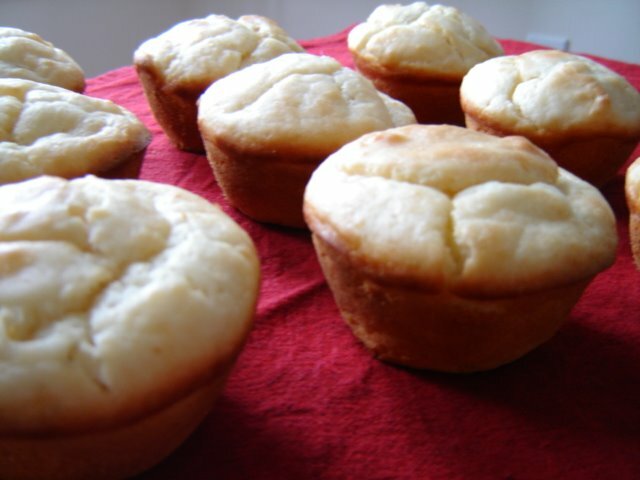 Using an electric mixer, beat the butter and sugars until light and fluffy. Beat in the eggs and vanilla. Combine the flour, baking soda and salt in a separate bowl. Stir into the butter mixture. Stir in chocolate chunks and nuts. Using 1 1/4-inch ice cream scoop or tablespoon, drop the dough 2 inches apart on the prepared baking sheets. Bake for 12-15 minutes, or until cookies are slightly raised in the centre and browned on the edges. Cool 2 minutes before removing from pans to wire rack to cool completely. Store in a tightly closed container for up to 4 days. I was debating whether or not to bake something today. I really didn't need too but then when friends called to come over it was all the motivation I needed to whip up this tasty treat. 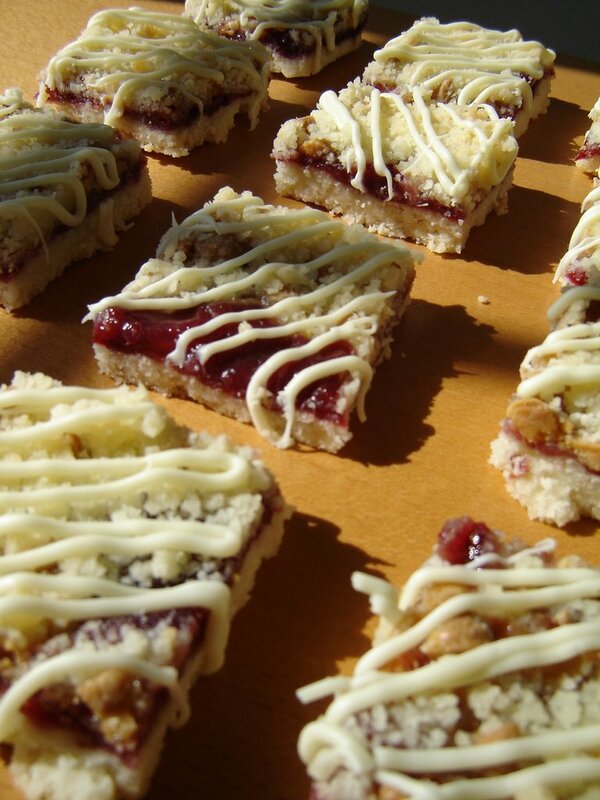 These raspberry bars are so simple and easy to make. I've made them many, many times before and they have never failed me. The bars consist of a shortbread crust topped with raspberry jam and chocolate chips. That's it. Reserved crumb mixture is sprinkled on top and then baked for 40 minutes until golden. We ate them warm out of the oven and they were perfect - crisp buttery crust with just the right amount of tart jam and sweet chocolate to satisfy any sweet craving. Try them today! Line 9 x 13 metal pan with parchment paper. Set aside. In bowl, beat together butter, sugar and salt until fluffy; using wooden spoon, stir in flour. Set aside 1 cup for crumble; press remaining dough into prepared pan. Spread jam evenly over base. Sprinkle with chocolate chips. Sprinkle fiiling with remaining crumble. Bake in 350 F oven until crumble is golden, about 40 minutes. Let cool in pan on rack. Dust with icing sugar. Makes 40 bars. Note: Jam spreads easily if warmed in the microwave for about 30 seconds. Source: Canadian Living Holiday Best 2002. I had very ripe pears sitting on my counter since yesterday that were beyond eating. They were brown and slightly mushy but I knew they could be transformed. The only thing to do with them was bake them into something exciting so I looked around for a recipe that made something small since I only had two. Well, I looked in Divine Indulgences on a whim. I haven't used this book in a while but had a feeling it might have something appropriate since the recipes do not make large quantities. I found Pear Raisin Streusel Bars and I had all the necessary ingredients so I went to work. The base was baked for 10 minutes before the pear/raisin filling and streusel went on top. 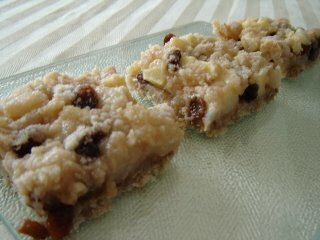 (I have to confess, I added one chopped apple because I was just shy of 2 cups) After 25 minutes I had some nice bars that are similar to a crisp-type dessert. They smelled great and cut into bars perfectly. They would taste even more yummy with a scoop of vanilla ice cream. Also, I was all the more impressed since this is a low-fat recipe that replaced some fat with water. (I don't do a lot low-fat baking.) This caused the bars to be less crispy and brown than a full-fat bar but still tasty. You can check out other low-fat dessert options at Rose Reisman's website. Over the weekend, I had my family over for dinner. None of them are big sweet eaters although my aunt does a fair amount of baking herself. I knew I needed to serve something for dessert that would go nicely with tea and coffee and wasn't too over the top so I decided on this semolina cake. I had made it before successfully and, although there is a sugar syrup poured over the hot cake, once cooled the sweetness of the sugar mellows considerably. Semolina is coarsely ground durum wheat that is highly glutinous. In its package it looks like cornmeal but once baked in a cake, it expands making the cake grainy. There is no flour added so the texture is not like traditional cake. Without the sugar syrup, the cake would be dry and crumbly. With it, each bite was syrupy and moist. It is very similar to the Middle Eastern cake called Basboosa. 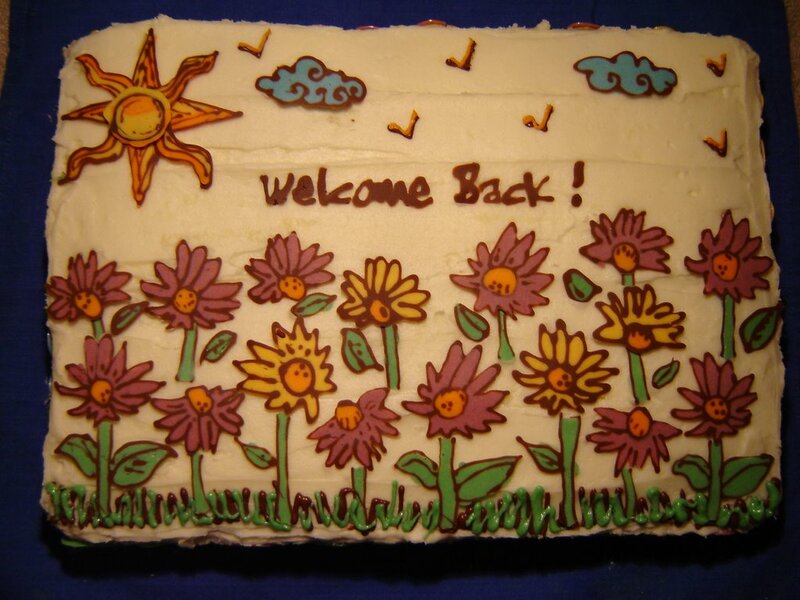 The cake was enjoyable to eat and everyone liked it. It is best eaten cut into small squares or diamonds and is an easy recipe to try when the desire to explore foreign baked goods takes hold. The theme for this month's Sugar High Friday is dairy. When I was deciding what to contribute, I thought about cheesecake or some type of custard. While these desserts are great, I don't usually have the opportunity to make fancier treats unless a special event pops up. 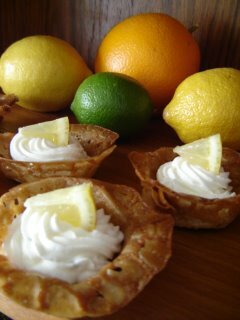 Because of this, I chose to make Citrus Lace Cups from Wanda's Pie in the Sky. These fragile little confections consist of a thin crisp almond cookie that is shaped and filled with a cream cheese citrus mousse. The recipe itself is not hard to prepare and has two major steps: making and shaping the cookies and preparing the filling. 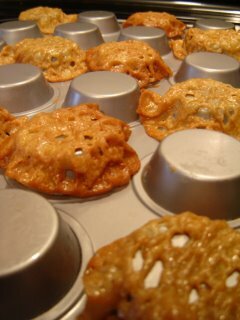 The cookies spread a lot in the oven and when they come out they have to be quickly draped over a mini muffin tin to create a cup shape. (see below) They can also be shaped around a wooden spoon handle and I will try that another time. The mousse is where the dairy component lies. 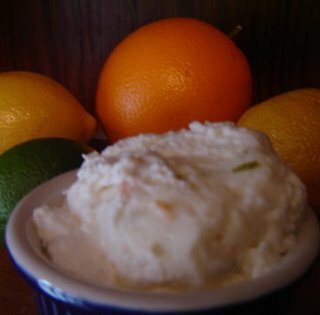 It's a mixture of whipping cream, cream cheese, orange, lime and lemon rinds, sugar and lime juice. Once combined, I scooped it into a pastry bag and filled the cups. The cookie remains crispy and sweet which is a nice contrast to the smooth citrusy tang of the mousse. If left filled for more than 20 minutes, the cookie softens and is less likely to crumble on you when you take a bite. Either way, they're lovely. My taste testers all agreed that the cups were a great treat and appreciated the refreshing citrus flavour. Some were even surprised to find there was cream cheese in the mix because it was so light and fluffy. Thanks to Andrew at Spittoonextra for hosting this month's extravaganza. For the cups: Preheat oven to 375 F. Line cookie sheets with parchment paper. Combine the butter, sugar and corn syrup in a medium saucepan. Bring to a boil over medium heat, stirring occasionally. Remove from the heat and stir in vanilla. Combine the flour and almonds and add to the sugar mixture. Drop by teaspoonfuls 3 inches (7.5 cm) apart on the cookie sheets. Bake for 5-6 minutes, until golden brown. Remove from the pan while still hot and use a spatula to drape over the back of a mini muffin pan to create little cups. It is important to work quickly before the sugar hardens. However, if it does harden, pop the pan back into the oven for a minute to make it pliable enough to continue. Let the cups cool completely. For the filling: Using an electric mixer, whip the chilled cream until stiff peaks form. In a separate bowl, beat the cream cheese with the sugar, the lime, lemon and orange zests and the lime juice until light and fluffy. Gently fold in the whipped cream. Using a piping bag and star tip, pipe the filling into the cookie cups. Assemble within 20 minutes of serving to maintain crispness. Garnish with raspberries and orange peel, if desired. Last night we were having lentil soup for dinner and I wanted to make some sort of bread to go with them for dunking. Since it was already late, I didn't have time to do yeast rolls so I decided to go with a savoury drop biscuit. As I was looking for a quick recipe I came across these buns. They are baked in a muffin tin but aren't really muffins, nor are they rolls. I thought they looked easy enough to whip up quicky and, as I read the ingredients, I realized there was no fat (butter or oil) or eggs included but there was mayonnaise. Wow. I wondered if they would turn out decent so I tried them out exactly as the recipe stated. Well, was I pleasantly surprised. They baked up fantastic! They were not bland and had a fluffy texture while the outside remained crisp. They really are great with soup and the can easily be jazzed up with cheese, finely chopped parsley, a dash of chili powder...whatever you may fancy. The recipe is from The Clueless Baker and since the recipe is short, I'll post it here until I get an archive up and running. Preheat oven to 400 F. Grease a 12-cup muffin pan. In a mixing bowl, stir together the flour, baking powder and salt. Add the milk and mayonnaise. Stir with a fork until everything is blended and mixture is smooth. Spoon into well-greased (or paper-lined) muffin pan, filling the cups about 2/3 full. Bake for 20-25 minutes, until the tops are lightly browned. Remove from pan, let cool and serve slightly warm. Makes 8-10 quick little buns. If you like chocolate cake, these are the cookies for you. Made with cocoa powder, sour cream and studded with semi-sweet chocolate chips, these cookies are soft, moist and cakey. The batter is similar to the banana cookies I made last week. It is soft and not scoopable. I made these cookies a little bigger and they baked for 12 minutes. The white chocolate drizzle is part of the recipe but can be omitted if you like -these cookies are completely tasty on their own. The recipe comes from The Good Cookie and is one of the easier cookies to make. (Perfect for beginners.) They pack a solid chocolate punch and are satisfying when cravings for a dense, fudgy cookie sneak up in the middle of the night. "Packed with flavour, these golden bars sandwiching a fig puree are similar to (but a lot better than) their store-bought relatives." This is the intro written about these bars by Canadian Living and I can agree that they are quite tasty. 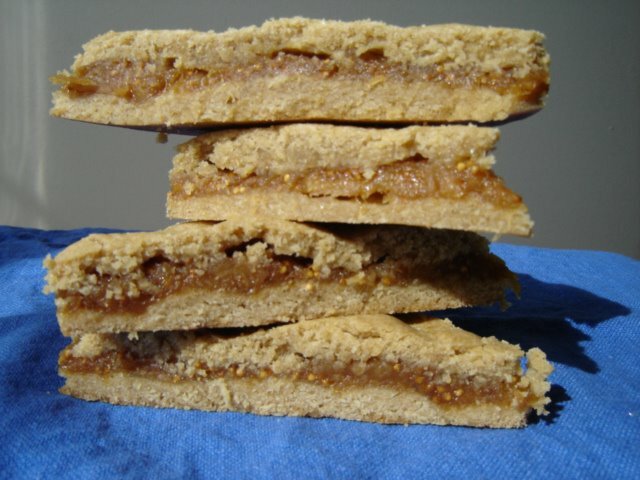 The filling is a mixture of figs, orange juice and peel and the bar is a simple brown sugar dough. There is no sugar added to the filling so the sweetness of the figs shines through. It fits into a 8-inch square pan and bakes up until lightly browned. I cut the bars into triangles just as they are shown in the magazine. The bars are soft and the filling is very flavourful, with the orange being very pronounced. They do taste like Fig Newtons but are not nearly as sweet. The cookie part balances nicely with the filling and the little fig seeds add some pleasant texture to the overall taste of the bar. They are perfect for snacks and I'll absolutely be adding this recipe to my keeper pile. It might even work with dates, but that's another recipe for another day. It's maple syrup time in Ontario and the sap is flowing. Having grown up here, I have been on numerous memorable school trips to the 'sugar shack' to learn about the maple syrup process. On a recent visit to Mountsberg Conservation Area, we enjoyed a full afternoon doing just this. Maple syrup is a Canadian staple product that can be used in baking as a sweetener or poured on top of ice cream, waffles and pancakes. It has a distinct flavour that no store-bought pancake syrup can compare. 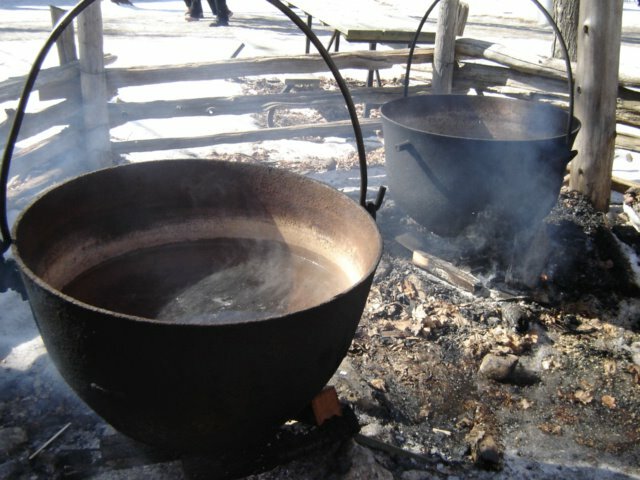 The process for making maple syrup is time consuming and directly affected by the weather. Warm sunny days and frosty nights are perfect for sap flow. 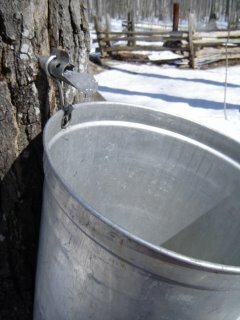 To begin, maple trees (there are many types) are tapped with a spile and a bucket is hung to collect the sap. Once enough sap is obtained, it is poured into an evaporator and heated until the sugar content is about 65%. Sap is colourless and, as it boils, it becomes more amber in colour. This colouring determines what grade the syrup is - lighter is not sweet and too dark is only used for baking. Medium amber is best and is what can be found on the grocery shelf. Larger producers will have the trees linked up by tubing that flow into one central container to minimize collecting times. 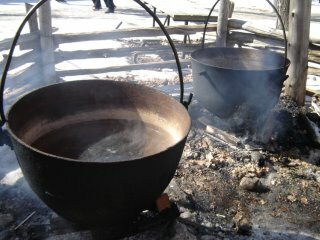 In the days before modern technology, sap was poured into large pots and boiled over an open fire. Since I'm no expert, this is a just a watered down version of the syrup process but for a more detailed and scientific explanation visit Canadian Maple Syrup where you can also read about the history of maple syrup as well as some interesting facts. I've used maple syrup in cookies and it lends a lovely sutble maple flavour to the finished product. It can also be used to flavour frostings and glazes. 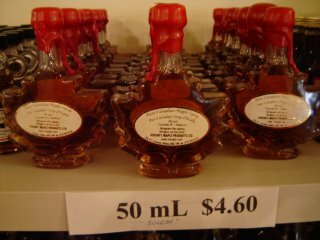 Due to its production process, maple syrup is expensive and rightfully so. It is a reflection of the Canadian spirit where something so simple can be transformed into something truly wonderful. Butter tarts are probably one of the Canada's most popular homegrown desserts. According to Wickipedia, butter tarts were a staple of pioneer Canadian cooking, and they remain a characteristic pastry of Canada, considered one of only a few recipes of genuinely Canadian origin. Butter tarts can come in a multitude of variations and most Canadians have a favourite. They can be made plain or enhanced with chocolate chips, nuts or raisins. The shortbread pastry is topped with a filling consisting of butter, eggs, brown sugar, corn syrup, vanilla and vinegar. Of course, as with all other recipes, there are many adaptations with regards to ingredients. Some people like their filling gooey so that sweet syrup drips down the chin while others prefer their filling a little more set. To prove that Canadians take their butter tarts seriously, check out "What makes a great butter tart?" at the CBC website. The version of the butter tart I made are actually squares and come from Wanda's Pie in the Sky. They're an easier and faster take on the tart but their essence is the same. This version bakes up handsomely and has a good balance of butter pastry and toothsome filling. I made these plain and they are really at their best at room temperature or chilled in the refrigerator. They are rich, smooth and perfect with tea. A great Canadian treat. Whenever I have a ripe banana on the counter I always get a request for banana cookies. These cookies are a favourite around here so I make them quite often. I found this recipe years ago in the Treasury of Desserts and initially made them because you only need one banana and they are quicker to make and bake than banana bread. They turned out so well and were enjoyed by eveyone that now I could not imagine ever not making them. 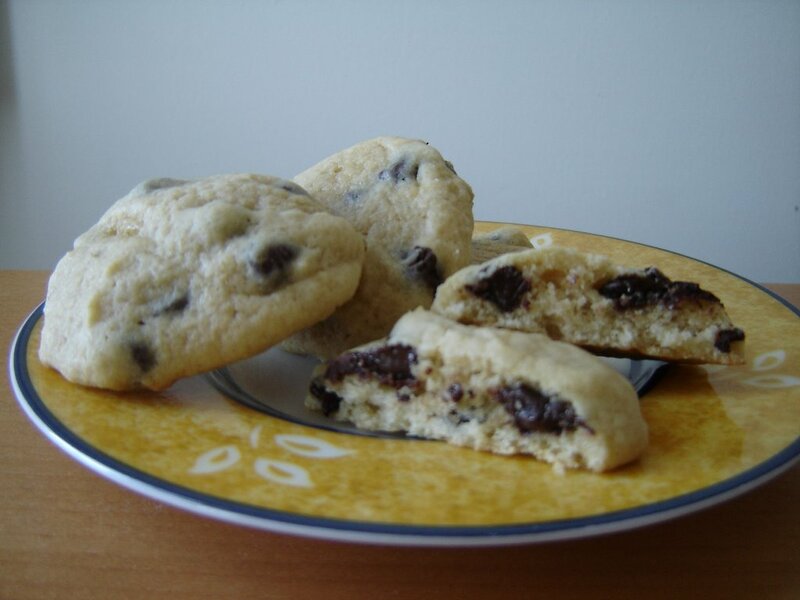 The cookie is a simple drop cookie that can be made plain or with chocolate chips and/or nuts. The batter is soft and cannot be put into a cookie scoop so it must be spooned onto the cookie sheet. These cookies turn out wonderfully soft and cakey. They are not meant to be crisp and taste like little mini banana cakes. Since the recipe only makes about 2 dozen, there are usually never any left for the next day. I found a very similar recipe here, though the measurements are not the same if you'd like to try them out. 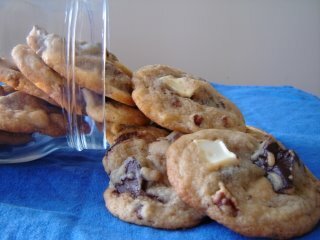 I used Hershey semi-sweet chocolate chips for this batch, though milk chocolate would work just as well.